"Milieux " (the French word for an environment, a setting), created by urban planner/ visual artist Miguel A. Vazquez in 2008, is the piece that allowed Art VULUPS to come into fruition. It is the tangible and visual component encapsulating the basic purpose of Art VULUPS: to promote basic land use and sustainability concepts, where art work sparks curiosity and becomes the excuse for civic dialogue engagement. 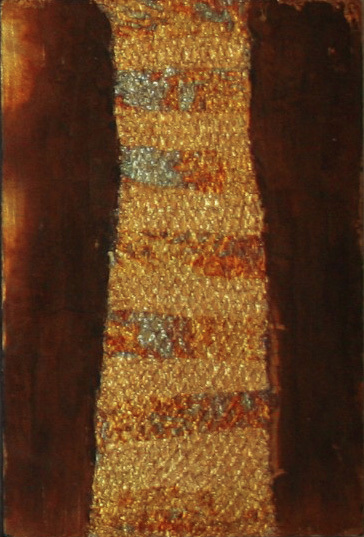 "Milieux" is a mixed-media 63"X 22" pentaptych panel made out of discarded foam board , wood, string, silicon, paint, patina, onion net, composition gold, aluminum and 22 karat gold leafs. 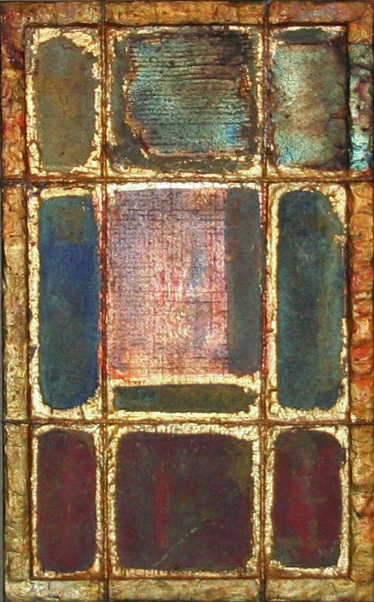 Each panel measures 11"X17", except for the middle which is 18" high. Originally, they were made to stand alone to convey a land use concept. The unexpected happened when they were laid down as a group; they became an integration of co-related concepts into one piece. This alto relievo piece represents a mental depiction of an aerial view of the Menifee Valley, California. 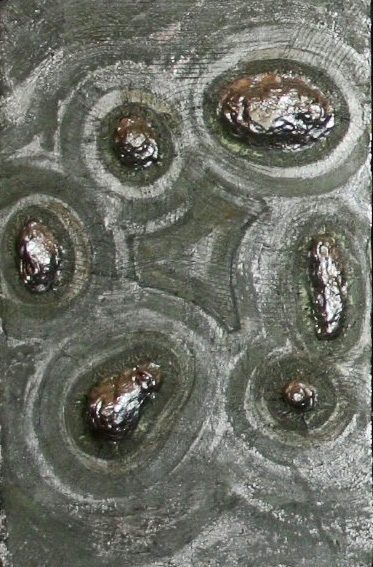 The silver leafed blubs represent the most prominent landmarks in the landscape, the hills. This piece conceptually means the lay of the land, the place containing the environment's hard surface, where water and air flows and circulates. It is here where flora and fauna interact and where carrying capacity can be measured. Is it like a blank canvas to paint on? A surface for a pristine continuum? Or is it both? Historically, how has it been? How will it be in the future? Native American archaeological sites inspired this piece. 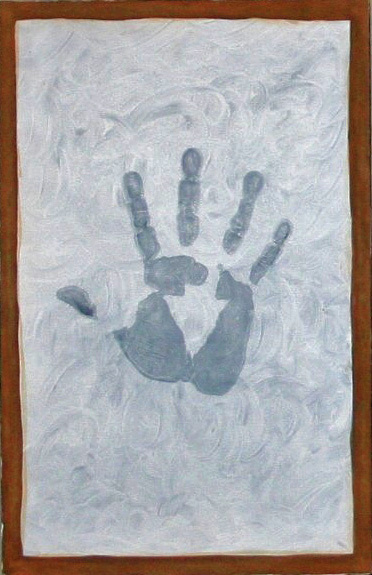 The hand print represents the continuous human impact on the land and the environment within. The level of impact has varied through space and time and has changed largely by the level of generational technological capacity. Can hand prints found through pre-history, history and today provide a glimpse into the various levels of sustainability? Systematic human settlement and land as a commodity are conveyed in this piece. The ubiquitous intersecting gilded lines bounding property and creating ownership have forever changed our collective relationship with the land. The different colors depict the different land uses assigned in a "Master Plan," a land use planning term. Technology also plays a central role in deciphering its content. This includes surveying systems which have allowed for the conversion of imaginary lines into city borders, property lines, lots, parcels, plats...and with that...habitation, commerce and opportunity for the exploitation of the riches of the land. "She who owns the land, does whatever she wants with it!" Can she? 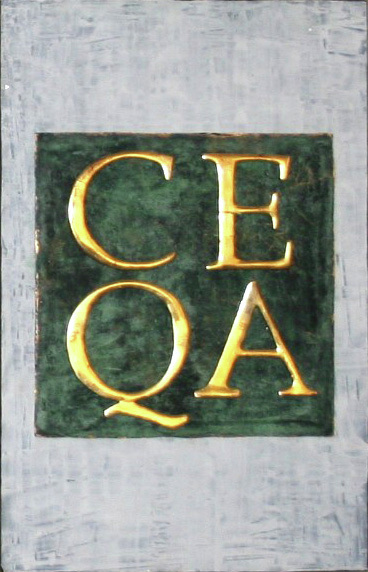 The 22-karat water gilded wooden letters spelling CEQA (California Environmental Quality Act) enclosed in a green patina box embody the land use development regulatory statutes. They exist by virtue of balancing property rights, the public interest and the protection of health and safety. Science and technology support our ability to measure the level of impact we exert upon the land and the resources contained within. This ability also reveals our level of interaction with the environment. Outside of the impenetrable patina box, the intangible, the emotional, the spiritual and other human values influencing the land use development process reside. Is that influence significant? Insignificant? The last panel symbolizes the linear verticality of a building, a structure occupying space in which human interaction takes place. They are the tangible result of planning (and sometimes, not planning) processes. They represent our landmarks, our property, our towns. The golden crisscross ripples and the layers convey in texture and form the innumerable relationshiops between individuals, disciplines, and technology. Embedded in the land use planning process are politics, society, the economy and the environment...our linear thinking. In contrast with the first piece, representing the natural environment, the golden color of this last panel hints at the value we place on our built environment. Which is more valuable? Silver or gold?